from Lord Derby’s Bridget in 1779 to Khalid Abdullah’s Enable in 2017. Although the above chart has been greatly reduced, it measures 66 cm x 59.4 cm or 26″ x 23 1/2″ and is printed on 250 GSM ‘Natural’ ParchMarque Plus . From a limited edition of 90, copies are available directly from Michael at £60 including postage & a sturdy postal tube. All winners and the date won, are shown in Green capitals and in the ancestry, Champion Sires are shown with an asterisk * either side of their name. A further oblong box, shows the fastest times, longest and shortest winning distances, records of largest and smallest fields and prizemoney. There are also photographs of the Founding Fathers – DARLEY ARABIAN, BYERLEY TURK, GODOLPHIN ARABIAN and ECLIPSE. I hope you will get great pleasure from the chart and enjoy owning a piece of Turf history. On Derby Day, 1913, two dramas were played out on Epsom Downs before a crowd of half a million people – one a tragedy, the other a scandal. As the field swept round Tattenham Corner, a protesting suffragette, came from under the rails into the middle of the race, fatefully, bringing down the King’s horse and jockey and so creating the iconic moment for the Suffragist movement. Minutes later, the stewards brushing aside the incident, formed an incomplete quorum, to disqualify the winning favourite amid claims of prejudice and personal vendetta. The promoted winner started at 100-1, and the horse that finished third was not placed by the judge. These events and the motives behind them headlined the news for many days. The Suffragette, Emily Wilding Davison was born on 11 October 1872, in Blackheath, London, but lived in Longhorsley, Northumberland. After attaining B.A. Honours at the Royal Holloway College, she went on to study English Language and Literature at St Hugh’s College, Oxford, where she won first class honours. However, and this may have proved significant, women, at that time, were not admitted to obtain degrees at Oxford. In 1906, Emily joined the Women’s Social and Political Union, known as the WSPU, a movement led by Emmeline Pankhurst, who defiantly believed that ‘direct action’ would lead to women gaining the vote. Three years later, Emily gave up her position as teacher to a family in Berkshire, in order to promote the cause of women’s suffrage and very quickly came to the forefront of the ‘direct action’ groups. Although her police record has little to do with the Derby, it is only with the knowledge of her dedication and fervency that her action at Tattenham Corner can be understood. Never one for compromise, Emily once barricaded herself in her cell to avoid being force-fed, only for a prison officer to force a nozzle of a hosepipe through the window, to drench her and flood her cell. On another occasion, in protest to her fellow suffragist’s being force-fed, when not on hunger strike, she jumped down an iron staircase and received severe spinal injuries. Her seven prison sentences included six months for setting fire to post boxes in Holloway. There she soaked rags in paraffin, set them alight and then pushed them into the boxes – a crime that started a wave of similar incidents. Sentenced at the Old Bailey and force-fed, she was released only 10 days before the end of her sentence due to injuries incurred. Emily was also imprisoned for 10 days for assaulting a Baptist Minister with a dog whip in Aberdeen, mistakenly identifying him as David Lloyd George. Mercifully, she was released after four days’ hunger strike. Although completely dedicated to the cause, Emily Davison was regarded by many in the movement as a maverick and few if any, knew what disruption she had planned for Derby Day. On the morning of Wednesday, 4 June, 1913, Emily took two large flags of the suffragist colours – green, white and purple stripes – folded them into a large pad and pinned them inside the back of her jacket, possibly for a demonstration. She then travelled to Victoria Station where she notably bought a return ticket to the Tattenham Corner Station at Epsom. The Derby was the third race of the afternoon. Emily stood towards the end of Tattenham Corner, about ten rows back from the rails and, directly opposite the Movie cameras. Significantly, this was the first race where the horses were to come around Tattenham Corner; the two previous races over five furlongs having started opposite her, from a shoot to the straight. The author, having watched the flickering film, frame-by-frame many times, can confirm that after nine of the 15 runners had past there was a gap of a few yards, into which Davison, dressed in a large black coat and hat, slipped under the running rail holding what looked like a sheet of paper, perhaps a petition. Moving towards the next on-coming horse – Agadir – she stepped aside. Two more horses passed close by and in each case her attempt to grab their bridle was unsuccessful. Then, after a space of about four lengths, Emily stood purposely in front of the next horse, Anmer, owned by King George V and putting her hands up, apparently to grab the bridle, she was forcibly bowled over by the horse, who, a split-second later crashed to the ground, taking Herbert Jones, trapped in a stirrup, down with him. Photographs show that apart from those spectators on the rail in front of the incident, most of the crowd were intent on following the race around the bend. However, seconds later, people rushed towards the stricken parties from the other side of the course. In retrospect, it seems highly unlikely that Emily, without hearing any form of race commentary, would have known where in the running order the King’s horse would have been. Also, from her position, surrounded by spectators, some standing on top of carriages, she was unlikely to have seen the first batch of runners coming until they were upon her. Ironically, the first horse she made contact with, was the King’s horse and so doing brought her martyrdom the maximum publicity. Fortunately, the cinematograph operators of the Gaumont Company were situated on the other side of the course, opposite the incident. With great initiative the film was shown that evening at the Hippodrome and Coliseum Theatres and later, at many other London and provincial cinemas. An examination of Emily’s pockets after the race included the racecard, known as Dorling’s List, a helpers pass for the WSPU Kensington festival and a handkerchief bearing her name, which quickly proved her identity. “fracture of the base of the skull caused by being accidentally knocked down by a horse through wilfully rushing onto the racecourse at Epsom Downs”. Herbert Jones, also found unconscious, was first taken up the course on a wheeled stretcher to the weighing in room. When unable to get through the door, he was taken to a room at the back of the stands. His examination revealed a fractured rib, cuts and bruises on the body and a black eye. On regaining consciousness, he was taken to the Great Eastern Hotel, Liverpool Street, where he stayed the following day, returning to Newmarket on the Friday. The King’s horse Anmer, although suffering bruises recovered amazingly well, reappearing in the Ascot Derby two weeks later. However, he failed to win another race, either that year or the next. The funeral of Emily Davison was not only noble and impressive, but it became the iconic event in women’s suffrage. Starting from Victoria Station 6,000 suffragists, many dressed in white and carrying white lilies, marched through streets to St George’s Church in Bloomsbury, where the funeral took place. The coffin and attendants, then travelled by train from King’s Cross Station to Newcastle and finally, to the churchyard of St Mary the Virgin, Morpeth in Northumberland, where 30,000 people attended. Her gravestone bore the WSPU slogan “Deeds not words”. Fatefully, it is worth considering, had Emily stepped on to the racecourse a few seconds earlier, she would have brought down half the field and their jockeys, perhaps causing deaths other than her own. A few seconds later, the horses would all have passed and the incident would have been reduced to a footnote. To move from the tragedy to the scandal – the prejudice that caused Craganour to be disqualified had its origin in the sinking of the Titanic the year before. Charles Bower Ismay, owner of Craganour, was the younger brother Bruce Ismay, the Managing Director of the White Star Line, who was rescued from the Titanic, when 1,517 others lost their lives. In the following enquiry set up by the United States Senate, Bruce was strongly criticised by the Hearst Press, who roundly accused him of cowardice. Later, although a British inquiry exonerated him, the stain on the family’s reputation remained. The two brothers were close, Bower Ismay having married the sister of Bruce Ismay’s wife. In consequence, the prejudice against the Ismay’s was widespread and brought to bear when Craganour, appearing to win the Two Thousand Guineas, was overlooked by the judge in favour of Louviers, despite press photographs clearly showing the opposite. Major Eustace Loder’s involvement came originally as the breeder of Craganour, the colt fetching 3,200 guineas – the top price at the 1911 September Doncaster Sales – knocked down to Charles Bower Ismay. Later, to compound matters, he believed Ismay to have had affair with his sister-in-law. The eventual winner of the 1913 Derby, Aboyeur, had shown promise when winning the Champagne Stakes at Salisbury. However, after running poorly in the Easter Stakes at Kempton on his three-year-old debut, his Derby odds drifted to 100-1. In the Race, rounding Tattenham Corner, Aboyeur led the field from Craganour, until turning into the straight, where Craganour, ridden by Johnny Reiff (a fearless American Jockey) bumped Aboyeur, sending him to the rails, so cutting off Shogun. In the final furlong, Aboyeur, under pressure from Edwin Piper’s whip, continually leant into Craganour as the pair moved off the rails. They passed the post together, but Craganour’s number was hoisted as the winner. Charles Bower Ismay led in his colt and the ‘all right’ was given. But as Craganour was led away, Lord Durham rushed out to announce a stewards’ inquiry and an objection to the winner. Strangely, Aboyeur’s owner Alan Cunliffe, a shrewd gambler who stood to win nearly £40,000, had seen no reason to object – the objection came from the stewards. Initiated solely by Major Eustace Loder, but with the support of Lord Wolverton, they formed an unchallenged quorum of two, after the remaining stewards had declared a personal interest. After a lengthy period during which another race was run, the verdict came: Craganour was disqualified and placed last on the grounds that he had jostled Aboyeur, caused serious interference to three other runners, and had ‘bumped and bored Aboyeur so as to prevent his winning’. Incredibly, Ismay’s notice of appeal to the clerk of the course was received a day outside the appeal deadline. Adding to the confusion, Day Comet, who had finished third but was obscured from the judge’s view, was assigned no official place and the error was never corrected. A week after the Derby, Ismay, now realising Craganour had no future in Britain, either on the racecourse or at stud, sold the colt to Senor Martinez de Hoz, owner of the famous Chapadmalal Stud in Argentina, for £30,000 (over £2 million today). Aboyeur ran twice more, finishing third in the St George Stakes at Liverpool and second in the Gordon Stakes at Goodwood. He was then sold for 13,000 guineas to the Imperial Racing Club at St Petersburg in Russia before disappearing in the Russian Revolution. Major Eustace Loder (1867-1914), was a successful breeder and owner. 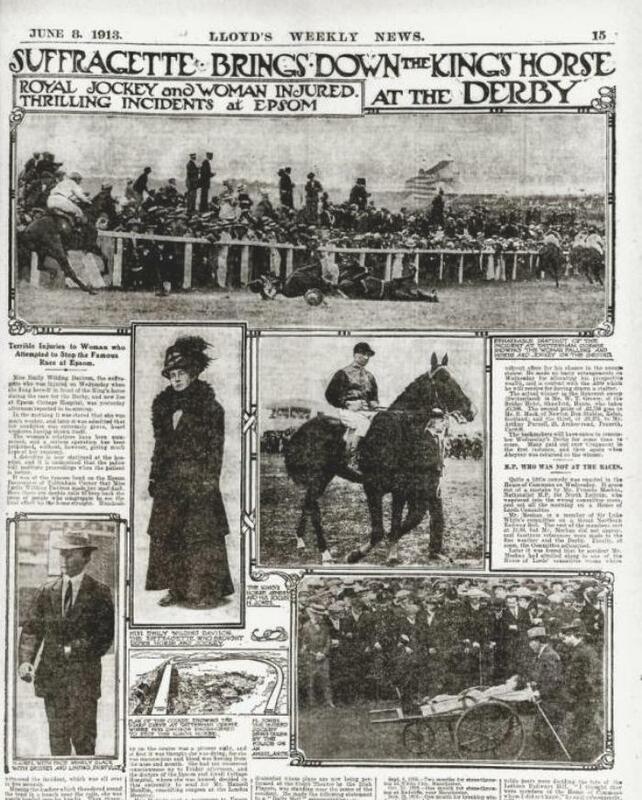 In 1906, he won the Derby with Spearmint, although his best horse by far, was Pretty Polly, adored by the public she won of 22 of her 24 races, including the Fillies’ Triple Crown in 1904. Controversially, Loder is remembered for his part in the disqualification of Craganour, the publicity and consequences of which left its mark and he died a year later aged 47. Returning to the Suffragette cause, a daggers drawn altercation had developed between Emmeline Pankhurst and David Lloyd George. On 20 February 1913, after The Times reported: ‘An attempt was made yesterday morning to blow up a house which is being built for Mr Lloyd George, near Walton Heath Golf Links’. That evening, at a meeting in Cory Hall Cardiff, Mrs Emmeline Pankhurst, the leader of the militant suffragette society, the Women’s Social and Political Union, proclaimed ‘we have blown up the Chancellor of Exchequer’s house’ and, ‘for all that has been done in the past I accept responsibility. However, all was to change with the outbreak of the First World War in August 1914. Firstly, all the imprisoned suffragettes were released unconditionally. After which, Mrs Pankhurst recommended a temporary suspension of militant activities, calling for her followers to actively campaign for women’s war work. In 1915, after a crucial need for a million more shells, Lloyd George, now Minister of Munitions, met with Mrs Pankhurst, suggesting she led a Women’s Right to Serve demonstration to overcome trade union opposition to female labour. She did, and within months 80% of the munitions’ workforces were women. Known as ‘Munitionettes’ they produced a continual flow of 18lb shells to win the war. In 1918, citing the work carried out by women during the First World War, the Government gave women the vote if over 30 years of age and a property owner, or married to a property owner. Ten years later, the age limit for women was reduced to 21, the same as for men. A centenary after the tragedy on Epsom racecourse, the Jockey Club unveiled a commemorative plaque to Emily Wilding Davison on the rails at Tattenham Corner. The unveiling ceremony on Thursday, 18 April 2013, was attended by, “the largest gathering of Emily’s descendants and relatives to date”. As a point to note, 40 years ago top stallions were usually limited to 40 mares per season and like Shergar were often syndicated as such. Galileo’s dominant position and influence in Thoroughbred breeding, albeit with Frankel waiting in the wings, is strengthened by now having at least three times the opportunities of earlier sires. In 1906, Richard Wootton, an Australian and South African racehorse trainer, came to Epsom with his sons, Frank, aged 13 and Stanley, aged nine. After opening a stable at Treadwell House, Epsom, his sons served their apprenticeships with him and although not as successful a jockey as his brother Frank, in 1910, Stanley won both the Chester Cup and the Northumberland Plate on Elizabetta. Serving as an officer in the Royal Fusiliers, in the 1914-18 war, Stanley was awarded the Military Cross. The war over, he took the reins from his father at Treadwell House, training around 25 of his own horses with the sole purpose of landing betting coups. So successful was he, that in 1925, he bought Epsom’s Walton Downs for £35,000, simultaneously taking a lease on the Winter Gallops, within the racecourse. In 1969, Stanley Wootton generously offered the Horserace Betting Levy Board the Six Mile Hill gallops on Walton Downs on a 999-year lease, so ensuring their preservation as training grounds. George Wigg was born in Ramsdell in Hampshire in 1900, and from winning a scholarship to Queen Mary’s Grammar School in Basingstoke, he joined the Army, serving in the Royal Tank Corps from 1919 to 1937. On the outbreak of World War II, he re-enlisted in the Royal Army Education Corps and in 1945, became Labour MP for Dudley under Clement Attlee. From serving under Harold Wilson he left Parliament as Baron Wigg of Dudley and thereafter, from the House of Lords and as Chairman of the Horserace Betting Levy Board (from 1967), he, together with Stanley Wootton set about protecting the future of Epsom Downs Racecourse. Memorably, Lord Wigg’s amendment was carried by 92 votes to 33. Since then, a memorial viewing point has been erected on Epsom Downs in recognition of the work of Lord Wigg and Stanley Wootton, for the preservation of the Downs. On Epsom Downs, under a threatening sky, ten runners made their way to the start. Rhododendron, a Galileo filly, and second to Winter in the Qipco 1,000 Guineas, was now 8-11 favourite and one of three entries trained by Aidan O’Brien. Enable, trained by John Gosden, ridden by Frankie Dettori and winner of the Cheshire Oaks, was a popular alternative at 6-1, as was Godolphin’s Sobetsu, a recent winner of the Prix Saint-Alary at Deauville. American trained, Daddys Lil Darlin, second in the Kentucky Oaks, had been flown over to take her chance. However, without her usual pony and faced with the expanse of the Downs, she bolted. Careering towards the start and looking set to crash into the stalls, Olivier Peslier, fearing for his safety, jumped ship. Fortunately, the filly was rescued with no harm done and withdrawn. Meanwhile, a sudden and violent thunderstorm broke out over the Downs, with bolts of lightning and crashes of thunder bringing cries of alarm from the stands. Nevertheless, the nine runners courageously left the stalls, Pocketfullofdreams setting a strong pace for the O’Brien camp, followed by Enable and Sobetsu. The field, stretched out to the top of the hill, saw Pocketfulofdreams blazing a trail down to Tattenham Corner, five lengths clear of Sobetsu and Enable. Approaching the two-pole, Enable surged ahead until quickly joined by Ryan Moore on Rhododendron. The pair then battled it out head to head to the distance, where, Enable, proving superior, drew away through the heavy rain to win by five lengths. It was Frankie Dettori’s fourth Oaks. Meantime, O’Brien’s Alluringly, pluckily kept on for third, a further six lengths away. Surprisingly, Enable clocked 2 min 34.13 sec – a new race record, more so, as an extra 26 yards had been added to the distance to protect the ground on the inner rail for Derby day. RUN on Friday, 2 June 2017, as the Investec Oaks, over the Derby Course of one mile and a half and 26 yards, for three-year-old fillies, 9st 0lb. Also ran: 4th Horseplay (O. Murphy) 14-1; Coronet (A. Atzeni) 12-1; Isabel De Urbina (F. M. Berry) 33-1; Pocketfullofdreams (D. O’Brien) 50-1; Sobetsu (W. Buick) 6-1; Natavia (P.Smullen) 12-1 (last, 30 lengths behind the winner). 9 ran. Time: 2 min. 34.13 sec. (New race record). BRED by Juddmonte Farms Ltd. TRAINED by John Gosden at Newmarket. Enable has won 10 races (from 11 starts): 32Red.com Maiden Fillies Stakes, (AW) Newcastle, Arkle Finance Cheshire Oaks, Investec Oaks Stakes, Darley Irish Oaks, King George VI and Queen Elizabeth Stakes, Darley Yorkshire Oaks, Qatar Prix de l’Arc de Triomphe (twice),118Bet September Stakes, (AW), Kempton, Longines Breeders’Cup Turf , Churchill Downs. Third in a EBF Stallions Conditions Stakes, Newbury, behind John Gosden’s SHUTTER SPEED. The winner’s sire, NATHANIEL b.c. 2008 by GALILEO ex MAGNIFICENT STYLE, won 4 races (from 11 starts): St Helens Maiden Stakes, Haydock, King Edward VII Stakes, Ascot, King George VI and Queen Elizabeth Stakes, beating WORKFORCE, (2011), Coral-Eclipse Stakes, Sandown. Second to DANEDREAM in King George VI and Queen Elizabeth Stakes (2012). ENABLE is his first Group 1 winner. The winner’s dam, CONCENTRIC b.f. 2004 by SADLER’S WELLS ex APOGEE, won 3 races (from 7 starts): Prix de Chaillot and Prix de Cheffreville, Lonchamp, Prix Charles Laffitte, Chantilly. She has bred 3 winners from 5 foals (ENABLE was her 5th) incl. CONTRIBUTION b.f. 2012 by CHAMPS ELYSEES, won 1 race: Prix Kasteel, Maisons-Laffitte; TOURNAMENT b.g. 2011 by OASIS DREAM, won 3 races incl. Ladbrokes Handicap, (AW) Lingfield: 32Red.com Handicap (AW) Kempton. Following the first 50 years (1780-1829), the Derby had become firmly established as the premier event in the racing year. The old format of two and four-mile heats was being replaced with single races over a variety of distances and two-year-old races were becoming popular. Race meetings, such as Epsom, Newmarket, Ascot, Chester and Doncaster, were no longer run entirely by and for the aristocracy, but attracted an interest from a wider public. Fuelled by Bell’s Life, the general public would slowly, but increasingly, have knowledge of the more important race meetings and the results. From 1825, local printer William Dorling produced a racecard – “Dorling’s Genuine Card List”, also known as “Dorling’s Correct Card” – a seller of which can be seen in William Powell Frith’s painting of ‘The Derby Day’. The racecard, revolutionary at the time, not only gave the list of runners, but also their owners, pedigrees, jockeys, colours and, for the major races, the ‘state of the odds’. The point of sale for these racecards was The Spread Eagle in Epsom’s main street. There in the courtyard of the last coaching stop before ascending the hill to the course, assembled owners, grooms, jockeys, together with some of the darkest element of the betting fraternity. Many of the racecard sellers who worked around The Spread Eagle had their own eccentric and sometimes dramatic identity. The “King of the card-sellers”, was known as Jerry, who either as a Broadway dandy wearing a hugh straw hat, or a captain wearing a red coat and brandishing a spy-glass, would cling to the side of the carriages, mimicking the dandies and swells, while pocketing their sixpences. Sadly, one day in a moment of zeal he pulled a carriage over on top of him, causing havoc in the street and ending his life. Another card-seller was called ‘Donkey Jemmy’, his act was to wear a bright yellow wig and bray like a donkey. He would not bray for everyone though, as he would explain with pride – “I do the donkey to please the aristocracy, not the common people.” Other sellers who frequented The Spread Eagle were ‘Sailor Jack’, who played up a disfiguring squint and lack of knowledge on nautical matters, and the eccentric ‘Lord Castlereagh’, who although eating dry bread himself, would cook beef steaks for his French poodle. Finally, let’s not forget Fair Helen, ” a handsome dame she was too with her fine black hair” and who’s charm, it was said, could sell more than 700 racecards in a week. The following racecard – Oaks Day 1825, winner Wings – discovered by fellow historian, John Slusar, is thought to be the earliest existing copy, recently usurping the racecard of Derby Day 1827. 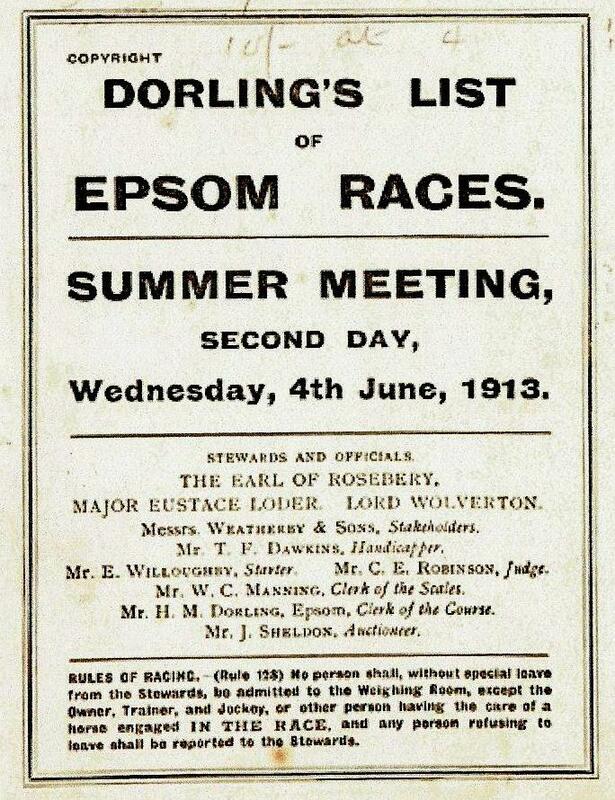 The Dorlings’ influence at Epsom lasted nearly a century. William’s son Henry became Clerk of the Course in 1839, until his son, the thoroughly unpopular Henry Mayson Dorling, took over and kept the position until his death in 1919. Returning to the mid-19th century, the railway system would not only revolutionise horse travel, but sportsmen would be able to travel from course to course in comparative comfort. Against this background, however, grew increasingly unscrupulous elements, such as thugs paid to make the favourite ‘safe’, crooked jockeys in the pay of ‘legs’ (early bookmakers) and con-men in many guises, who would stop at nothing to part both the aristocracy and the tradesmen from their money. Villainy on the Turf reached a new peak in the Derby of 1844, when the apparent winner Running Rein, owned by Mr A. Wood, a respectable Epsom corn-chandler, was in reality a four-year-old named Maccabeus. With Lord George Bentinck unravelling their plot and successfully pursuing the villains to the Court room. The Running Rein Scandal has its own chapter later in the book. But in spite of the Governments heavy-handed judgment, betting continued at all levels. Around this time there sprang up “list bookmakers”, who, defying the law, would pin up their lists of runners and prices and take bets in the pubs, bars and clubs, some even nailing them to trees in the popular London parks. The father of modern bookmaking, William Crockford (left), owned and ran Crockford’s Club (see illustrated below) in the heart of Mayfair. He also ‘made a book’ at the club and specialised in laying green young bucks “a thousand pounds to ten” they couldn’t name the winners of the future Derby, Oaks and St Leger. Said quickly, it might sound attractive, but only if the odds were to average less than 4-1 a piece! One of the most popular forms of betting at this time was the big-race sweepstake and the Derby Sweep was the most popular. Then, as now, people paid for a ticket in the hope of ‘drawing’ a horse and collecting a handsome cash prize if they won. These sweeps could be found in almost every town in Britain with pubs and clubs the most popular venues. Stakes would vary from thrupence or sixpence in the poorer places, rising to £100 in the smart London Clubs. Due to the reforming elements of the new administration, from the mid-19th century to the opening of betting shops in 1961, the only lawful way to bet on horseracing was either to attend the track or to possess a credit account with a licensed bookmaker. However, since the latter required the punter to have a bank account, references and, a regular income, most people opted to bet with cash through an undercover network of bookmakers’ runners. Course betting also had its disadvantages in the cheaper enclosures and on the open downs, where the less reliable or more speculative bookmakers would sometimes abscond (‘do a runner’), when unable to pay out. Beatings, and in later years slashed tyres, were often the punters ‘remedy’ in such circumstances! Racecards were very basic, printed in black and white and showed only the early declarations, making it necessary to cross out, sometimes a third of the runners. Interestingly, the 1913 (Suffragette) Derby racecard still called itself Dorling’s List. Later, as a schoolboy racegoer from 1948, I would paint the jockey’s colours into a notebook in order to identify the horses in the Derby parade. It seemed essential, since the first full colour racecard did not appear until 1995! The Tote first operated on Derby Day in 1930 and was not only welcomed for its win and place pools, but considered a safer alternative to some bookmakers on the hill. The game-changing introduction of betting shops in 1962 was inevitably followed by the progressive taxation on winning bets. In recent years, however, the wheel has come full circle. The Government’s abolition of betting tax in October, 2001, combined with the revision of gambling laws the following March, brought about a staggering increase in turnover. Meanwhile, in 2000, with the idea of launching a betting exchange, Andrew Black and Edward Wray, had secured £1m of investment from friends and family to become the co-founders of betfair.com. Betfair would operate on the principal of a financial exchange, combining many small bets in order to lay a gambler a large bet, or vice versa. Although other exchanges followed, within a few years Betfair had 90% of the betting exchange market in the UK. Then in 2010, successful and fully established, Betfair was floated on the London Stock Exchange, with a share price of £13. This rose to £44 before Betfair was delisted when merging with Paddy Power in 2016. With Great Britain now the gambling capital of the world, what will be the next innovation? Also ran: 4th Eminent (Jim Crowley) 5-1; Benbatl (Oisin Murphy) 20-1; Capri (Seamie Heffeman) 16-1; Douglas Macarthur (Colm O’Donoghue) 25-1: Best Solution (Pat Cosgrave) 12-1; Glencadam Glory (James Doyle) 33-1; Permian (William Buick) 8-1; Dubai Thunder (Adam Kirby) 9-1; Venice Beach (Donnacha O’Brien) 12-1; Salouen (F.M. Berry) 33-1; Khalidi (Pat Smullen) 20-1; Crowned Eagle (Andrea Atzeni) 33-1; Rekindling (Wayne Lordan) 25-1); The Anvil (Ana O’Brien) 66-1; Pealer (Silvestre de Sousa) 100-1 (tailed off, last). Commentary: A very open Derby this year, but late money for Cracksman (Investec Derby Trial) took him from 6-1 to 7-2 favourite. Aidan O’Brien ran six, from which Cliffs of Moher (Dee Stakes) was the choice of Ryan Moore, while Wings Of Eagles (second to Venice Beach in the Chester Vase) was almost friendless at 40-1 (55-1 Tote). Eminent, by Frankel and sixth in the Guineas was supported to 5-1, while Godolphin ran three, of which Dubai Thunder was the subject of a late gambol. On a sunny day with good ground, 18 went to post. On settling down, Douglas Macarthur led from the widest draw on the outside of The Anvil, Best Solution, Permian and Venice Beach. At the highest point of the course the O’Brien pacesetters, Douglas Macarthur and The Anvil, led by eight lengths from Venice Beach and Best Solution. There was no change through Tattenham Corner and into the straight, until two furlongs out, where Cracksman came to challenge Douglas Macarthur. Into the final furlong, as the long time leader fell away, Cliffs of Moher stormed past on the outside to take up the running from Cracksman and Eminent, with Wings Of Eagles closing fast. Thirty yards from the post Wings Of Eagles swooped past Cliffs of Moher to win by three parts of a length, with Cracksman a neck away third. The manner in which Wings Of Eagles won, was reminiscent of his sire’s Derby victory in 2011. This year recorded the seventh Derby victory for owners Michael Tabor and Mrs John (Sue) Magnier and a record winner’s prize-money (penalty value) of £921,537.50. 18 ran. Time: 2 min. 33.02 sec. BRED by Mme Aliette Forien & Mr Giles Forien in France. OWNED by Mr D. Smith, Mrs J. Magnier & Mr M. Tabor. TRAINED by Aidan O’Brien at Ballydoyle, Co. Tippeerary. The winner, WINGS OF EAGLES, won 2 races (from 7 starts): Irish Stallion Farms EBF Median Auction Maiden, Killarney, Investec Derby Stakes. Second in MBNA Chester Vase. Third in Dubai Duty Free Irish Derby, beaten a neck and a short-head by CAPRI and CRACKSMAN, when fracturing a near-fore sesamoid bone. He retires to stud at his birthplace – Haras de Montaigu where he stands at E12,000 for 2018. The sire, POUR MOI b.c. 2008 by MONTJEU ex GWYNN, won 3 races (from 5 starts): Prix des Feuillants, Longchamp, Prix Greffulhe, Saint-Cloud, Investec Derby Stakes. Sire of ONLY MINE b.f. 2013 ex TRULY MINE by ROCK OF GIBRALTAR, won Irish Stallion Farms “Bosra Sham” EBF Fillies’ Stakes, Newmarket, Bar One Racing Lacken Stakes, Naas. Second in Weatherbys Ireland Greenland Stakes; SACRED ELIXIR b.g. 2013 ex BALTIKA by STRAVINSKY, won BMW J.J. Atkins (Gp 1 2-y-o Turf), Eagle Farm. Ladbrokes Caulfield Guineas Prelude (Gp3), Caulfield, LUCRF Super Vase (Gp2), Moonee Valley, second in AAMI Victoria Derby (Gp 1), Flemington. The dam, YSOLDINA gr.f. 2002 by KENDOR ex ROTINA, won 1 race: Prix Sauge Pourpee, Maisons-Laffitte.Third in Gainsborough Poule d’Essai des Pouliches, Longchamp. She has bred 2 winners from 6 live foals incl. SWEET ELECTRA gr.f. 2013 by SEA THE STARS, won Prix de la Maniguette, Chantilly.